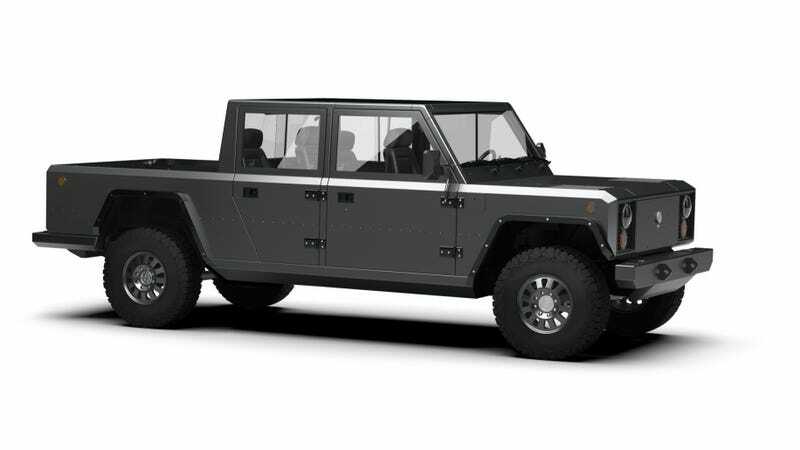 The Bollinger B1 is a rugged-looking, American-made, electric SUV that incorporates one of the most brilliant designs in auto history from a space-utilization standpoint. And soon it’s getting a truck sibling: the B2 pickup, which promises even better cargo storage capabilities. The world’s first electric truck isn’t anything fancy. And that’s the whole point. Right now it’s just a bunch of computer-aided design images, but eventually, Bollinger says, the aluminum-bodied B2 will become essentially a pickup-truck version of the B1. Oh yes, the pass-through on the B1—as well as the cab tailgate and lift-glass—also exists on the B2, and I think it’s even cooler in this truck application. Mostly because this machine is 207.5-inches long, and with the tailgates down, that becomes 233 inches. That’s about the length of an NFL field goal post that you can strap down to the electric utility truck. The bed itself won’t be huge, at 4'1" wide and 5'9" long, but the company says dropping the tailgate behind the cab, the thing will be able to carry four-by-eight sheets of plywood; with the glass hatch up, you can stack those half-inch sheets 72-high. Like the B1, the B2 will be categorized as a class three work truck, and it will have a payload capacity of 5,000 pounds and a towing capacity of 7,500 pounds. Bollinger says it plans to build prototypes in early 2019, and after thorough testing, production should begin sometime the following year. I hope they meet their deadlines, because the sooner we have this loony, Land Rover Defender-ish looking electric trucks on our roads, the better.